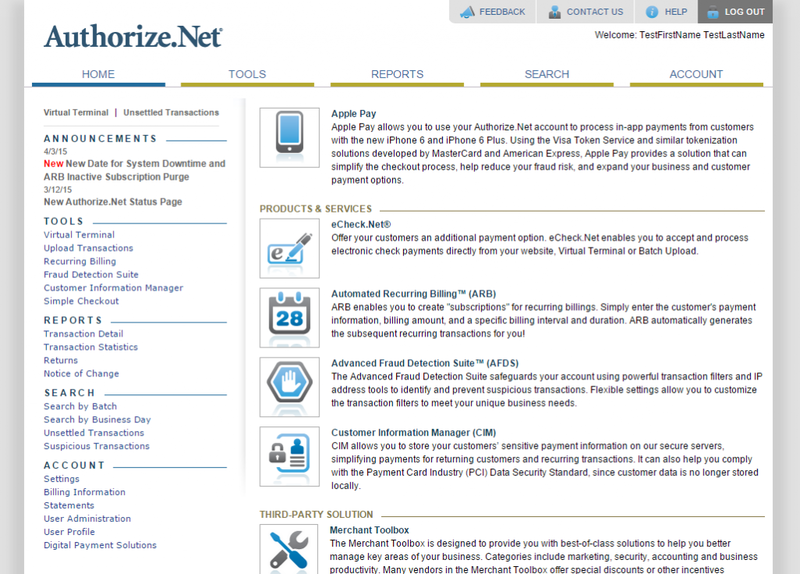 Authorize.Net is a well-respected, international Payment Gateway with a many features and benefits. 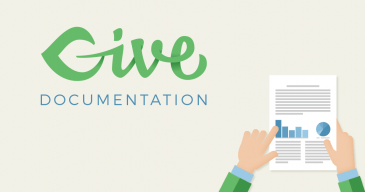 Authorize.Net allows you to accept donations directly on your website easily and seamlessly. In order to accept payments with Authorize.Net using Give you will need to have an active Authorize.Net account, the Authorize.Net Give Add-on, and the Core Give plugin installed and activated. After your Authorize.Net Add-on is activated, go to “Donations > Settings” and click on the Payment Gateways tab. There you will see the default Payment Gateways (PayPal Standard, Test Payment, and Offline Donations). You should also see Authorize.Net as an option as well. Click on that to enable Authorize.Net as your credit card Gateway for your website. If you would like to accept credit cards directly on your website with Authorize.Net you will need an SSL certificate. 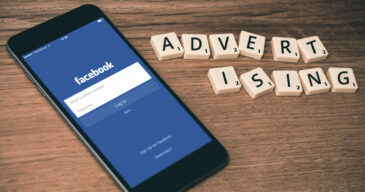 Once you have activated the Add-on it’s time get your API Keys and configure Give to integrate with your Authorize.Net account to accept donations. NOTE: When you first sign-up for Authorize.net, they provide you with two items which cannot be recovered easily later. Make sure that after you sign-up that you take note of both your Secret Question, and your Transaction Key. These items can be used immediately, but if you forget them or misplace them you will not be able to recover them easily and will instead have to delete them and generate new keys. After logging into your Authorize.Net account, you’ll be presented with your Authorize.Net Dashboard like the image above. From here, look in the left-hand sidebar and scroll down to the Account section and click on the Settings item. 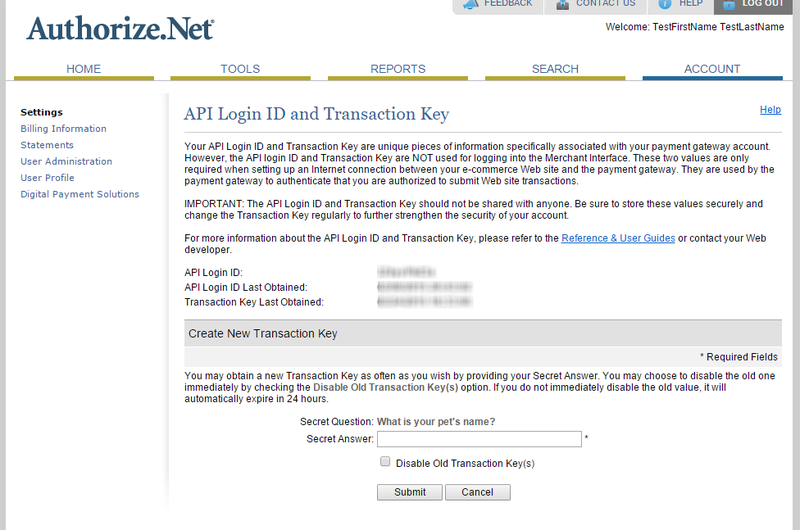 In the Settings page, look in the Security Settings and click on the link titled API Login ID and Transaction Key. Both of these are available on this screen. The API Login ID is clearly labeled at the top of the page. But the Transaction Key is hidden. This is why it’s important to save that after you first sign-up for Authorize.Net. If you didn’t save it, hopefully you saved the answer to your Secret Question. Because that’s the only way you’ll be able to recover that Transaction Key again. Input the Secret Answer in the field and you’ll be redirected to a page that provides you with your Transaction ID. Alternatively, you can select the Disable Old Transaction Key(s) checkbox and you’ll force the old key to be invalid and a new key to be generated. Copy each key and go to your WordPress site. Go to “Donations > Settings” and click on the Payment Gateways tab. There you’ll see a section called Authorize.Net Gateway Settings. Paste each key into it’s respective field, then hit save. 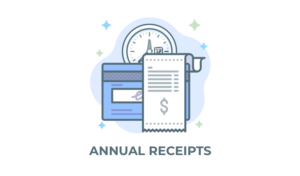 Give can be used with the Recurring Donations and Authorize.net to accept subscription donations within your live merchant account. To configure the integration, See the configuring Authorize.Net and Recurring Donations article. Problem: Give displays “Error: Phone is Required” message when attempting to make a credit card donation. Explanation: The Payment Form module in Authorize.Net has a field that is checked as “required” but it isn’t being passed to the gateway, therefore it’s rejected. Solution: Login to your Authorize.Net account and click on the “Account” tab. Next, click on the “Payment Form” link within the Transaction Submission Settings section. On the Payment Form page click on “Form Fields”. Ensure no fields are checked as “required”. Give handles required fields on the donation form side. It is not necessary for any of the fields to be required within Authorize.Net.